The other day I googled healthy lunches. Endless ideas, showing variation and perfectly portioned ingredients. As a realist, these pictures of perfection left me feeling slightly overwhelmed. Those Pinterest inspirational posts will have you adding an extra twenty ingredients to your trolley each week. They are now dubbed the IKEA lunch in my books. Not the Swedish meatballs, although I have heard they are tasty, ‘IKEA lunch’ because you need a set of complex instructions just to construct the thing each day. No thanks! We are all in search of the elusive answer to the perfect packed lunch. Quick, healthy, low cost and simple enough to allow space for the rest of your life. So, just how do you pack a healthy lunch every day and keep your sanity? 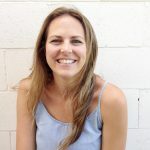 Well, I’m not sure I have the ‘elusive answer’ but here are some tips that changed the way I approach making healthy lunches. Whether your goal is healthy eating, saving money or simply getting more organised, setting aside a little time to plan and do some bulk preparing will rock your socks if you give it a go. I made these six lunches in twelve minutes. That’s just two minutes per lunch per day. Each day I add simple extras such as protein, seeds or nuts, dressing or even a wrap. 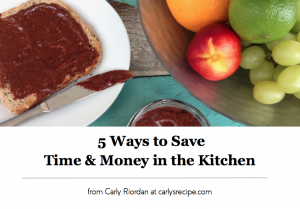 These add-ons are also pre-prepared, so perhaps you could add on another minute for each day still making the process highly achievable. And if I’m giving them to my husband I just add a wrap that he can plonk it all on and eat on the go. I started this process after I had kids and spent my days at home. Despite being home all day, I found I had less time and when hunger set in and the kids needed attention the last thing I felt like doing was taking the time to prepare something for myself for lunch. I’d just grab whatever was easy (generally something highly processed) thinking I’ll make sure I eat a healthy dinner instead. Adopting the planned preparation approach meant that there was lunch in the fridge waiting for me. Edit: I’m currently revisiting this post after a crazy busy last few months and not looking after myself. I need to get back into this habit as it’s a lifesaver for health and time. Place all salad ingredients on the bench. See my full list with tips below. Get out containers, jars, even zip lock bags ready to fill. Six per person is my max. Start with a handful of lettuce mix, baby spinach, rocket or shredded cos (if you use iceberg lettuce be warned it does brown easily although if you use a plastic knife, this is alleviated a little). Then get about adding all of your extras, making each day slightly different, so you don’t get bored. Group the things that last longer to two or three of the containers and the things with a shorter shelf life in the other containers. When it comes to eating your salads eat them in order of freshness. Eg cut capsicum won’t last six days, but it will last three or four. Cut tomatoes will last two or three days, but cherry or grape tomatoes will last a week. See the full guide below. For maximum benefit make up your salads on Saturday or Sunday at lunchtime then you are covering lunch for that day saving more time. 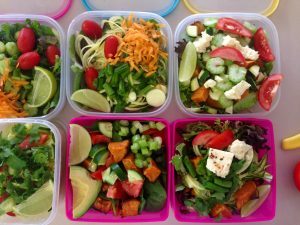 Pre packed salads can be used for dinner when you’re struggling to get yourself organised- bonus! asparagus balanced in boiling water for two minutes then refreshed in cold water. feta- will last two days at least. Note: Steer clear of onion or spring onion. Onions are designed to absorb bacteria so as soon as you cut them they are on their way to that smelly armpit onion smell that can happen. Ew! For the record If I am pre-preparing dinner or a salad I never cut onion early. Always leave it for the last minute. Use a grater or veggie peeler to create different textures with your veggies each week. Add different dressings. My fave is a simple squeeze of lemon or lime and a drizzle of extra virgin olive oil, but I also use my easy homemade Thai salad dressing or some quality balsamic vinegar (Balsamic is graded using a leaf system. The more leaves shows in the bottle the better the quality, less acidic it is and thus the more you’ll pay for it but it’s worth it) with some olive oil. These dressings can be pre-portioned in dressing containers ready to add fresh. If you dress it too early it will go soggy. Add some leftovers. If I’ve made a lentil salad earlier in the week then I might add a scoop of this to a few of the containers. Add different proteins and if you are not avoiding the cabs add a wrap, a roll or some bread. Cook a batch of chicken breast or meat patties then freeze in individual portions. Simply take out of the freezer and reheat and add to the salad. Do at least two kilos at a time to make it worth your while. Lately, I’ve been adding my homemade chicken tikka which also freezes well. I must post the recipe soon. Add a piece of fish. If I am at home, I’ll often take out a piece of fish from the freezer in the morning to defrost then pan fry in a little olive oil and a touch of sea salt. Leftover main meal pre-portioned and frozen such as Slow Cooked Greek Lamb, Mexican Slow Cooked Beef, Taco mince, or Mexican chicken. Leftover steak or roast sliced up is a bonus too. It’s about using what you have ready to go. Seeds such as pepita seeds add a nice crunch and can be pre-portioned into mini air tight containers used for dressing. The same can be done with nuts such as cashews, almonds or peanuts. Boiled eggs last up to five days in the fridge making them an easy addition. Can of tuna can be pimped up by adding a boiled egg or some fresh avocado it’s tasty and fulfils the requirement of lunch. If you are really pressed for time in the morning just grab your salad and buy some protein when you are in your lunch break. It will still cost way less than buying a full lunch and will be much healthier too. It’s worth playing around with this idea. It will honestly save you so much time, money and boost your health. I’d love to hear how you go. Comment below if you have some tips for making quick healthy lunches.